I used to read more junior fiction when I was editing more often than I currently am. 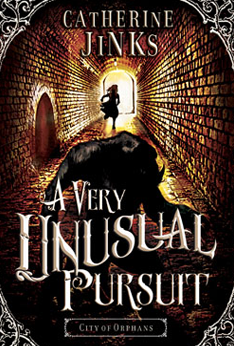 But recently I had the pleasure of being on a panel with Catherine Jinks at the Perth Writers Festival, which prompted me to read the book she was talking about: A Very Unusual Pursuit, Book 1 in the City of Orphans series. Not long after I finished it, I heard that it had won the children’s category of the 2014 Adelaide Festival Award for Literature—a well-deserved win, and congratulations to Catherine! Set in London c. 1870, A Very Unusual Pursuit gives us a Dickensian grimness leavened by gallows humour, a world sharply divided along class lines, an unsentimental portrait of childhood in which children work or they don’t eat—and, even then, they don’t eat much, or well. There are cafflers (rag-and-bone men) and costers (street sellers), dippers (pickpockets) and toshers (sewer scavengers), lurkers (criminals) and moochers (tramps), mumpers (beggars) and shirksters (layabouts). Nearly all of them are gammoners (liars). There’s Sarah Pickles, a matron with a gang of young pickpockets doing her bidding, and she’s far more ruthless than Fagin ever was. Life is cheap in Bethnal Green. Into this realist portrait of time and place, Jinks introduces a coexisting supernatural realm held in fear and spoken of in hushed voices, populated by creatures inhabiting dark places like chimneys, drains, privvies. Children go missing here, presumed eaten. Enter the Go-Devil man, Alfred Bunce, who, for a few shillings and an extra charge for materials (salt), will lure out and exterminate these creatures, generically called ‘bogles’. And what does a bogler use for bait? A child. The novel’s central character is Bunce’s ten-year-old apprentice, Birdie McAdam, whose sweet, pure singing voice draws the bogles from their lairs. The orphan Birdie is a beautifully realised, wholly believable character. Jinks arms her with a Victorian version of ‘girl power’ that would resonate strongly with young female readers especially (although the book’s appeal is wider than that), but she never breaches the boundaries of plausibility. Birdie is gutsy and forthright but always within the context of her time and place, her social position. If she says too much, if she oversteps the line of authority, the curmudgeonly Bunce hauls her back, and Birdie accepts his right to do so. But it will not stop her speaking her mind or overstepping again. Birdie is fiercely proud of her work—‘It’s a good living, and a respectable one’—and at the same time is aware of her vulnerability: the threat of the workhouse or Sarah Pickles is always looming should anything happen to Mr Bunce. A rogue doctor preying on the weak is at the centre of a satisfying plot, but there are subplots involving Sarah Pickles and her interest in Birdie, and a refined lady who also takes an interest in the welfare of the bogler’s girl, and offers a gentler kind of future for Birdie. Miss Eames, a student of folklore and the spirit world, dares to suggest that Bunce might try ‘scientific’ bogle-attracting methods instead of offering up little girls and hoping they’re quicker than the bogle. But Birdie is defensive and suspicious, afraid of losing her much-valued apprenticeship, and more generally, like Bunce, afraid of change. ‘But the skipper said as how he slept all night in that privy, and weren’t troubled, save by rats,’ Elijah unexpectedly volunteered. Jinks gives us a glossary at the back of the book, although in most cases it’s easy enough to discern the meaning of unfamiliar terms through the context in which they’re used. Catherine Jinks has won the Children’s Book Council of Australia Book of the Year three times, among many other prestigious awards, and has published more than twenty books. I loved this one. If, like me, you’re a bit of a kid yourself, you might love it too. There are two more books in this series: A Very Peculiar Plague and A Very Singular Guild. This review counts towards my total for the 2014 Australian Women Writers Challenge. Great – thanks Amanda. I shall look these books up. 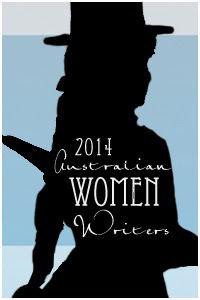 I’m a great fan of junior fiction, and we have some extraordinarily good women writers of the same in Australia. We certainly do, Liana, and some of them are right on our doorstep! Did you hear the wonderful news that Deb Fitzpatrick has just had The Amazing Spencer Gray (Fremantle Press) sold into the US market? Thanks for reading, and I hope you enjoy this one.